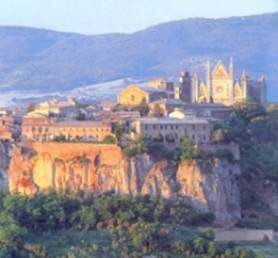 Orvieto exists in symbiosis with the tuff cliff on which it stands, an extraordinary example of the integration of nature by the work of man. An example of the fact that our ancestors were aware of this relationship between architecture and nature is the inscription on the famous well of San Patrizio which reads: quod natura munimento inviderat industria adiecit (What nature denied for defence - in this case water - was added by the work of man). Visiting this town means journeying through history, for traces of each and every period of the almost three thousand years of its existence. The two statues of Boniface Vlll set in the city gates at the opposite ends of the town suggest an ideal itinerary for the tourist of today, for the Pope entered the town through the Porta Soliana , known later, after the "Rocca" or Fortezza dell'Albornoz was built, as Porta Rocca, and he left through the Porta Maggiore . Boniface Vlll was anything but a tourist and had even been Capitano del Popolo in Orvieto, yet somehow these two statues, which earned him no less than a charge of idolatry, can serve as symbols both of the attention the city of Orvieto so truly merits, and the traditional hospitality of its inhabitants. Nowadays one no longer has to reach the top of the cliff on a mule, for a modern system of "alternative mobility" provides an access to the town that is both easy to use and fascinating with the funicular at one end and at the other, signs that the old historical centre, built on a human scale, has been returned to citizens and tourists alike and is once more the realm of the pedestrian.